When my family and I flew from Dublin, Ireland, to Atlanta, Georgia, in June 2017, I was really impressed by the high Dublin airport security and the thorough Customs check. In fact, I’d say it was the highest airport security I’ve ever experienced! What’s funny is that when we first arrived at the airport on the day of our departure, we had the impression security was too relaxed. That’s because we didn’t realize just how many steps it involves. Had my husband not urged us to get to the gate right away, we would’ve sat around having a late breakfast in a terminal restaurant. And I’m pretty sure we would’ve missed our flight. 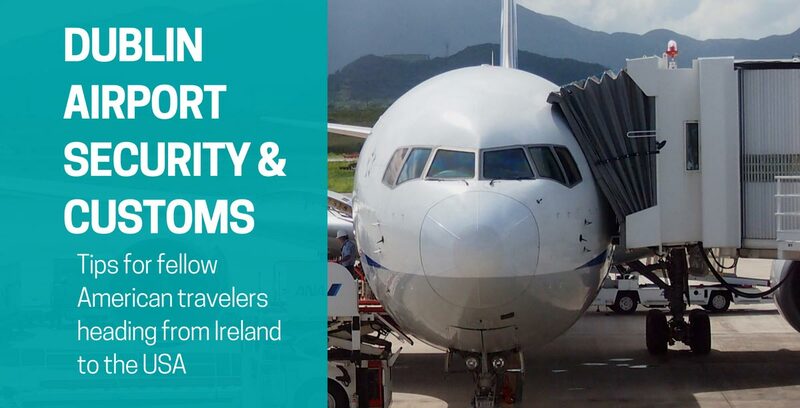 Read on to find out exactly the eight steps that Americans have to go through for Dublin airport security and Customs, for flights headed back to the USA. Note: We flew on Delta Airlines. So these directions may differ slightly if you’re flying with a different carrier, or from a different terminal. >> Also, check out my Ireland travel guide page! Plan to arrive at the airport three hours before your flight is scheduled to take off. That should give you enough time to make it through security and Customs. After we went through the entire process we had just a 45-minute wait at the gate before we boarded our plane. If possible, check into your flight the day before using your airline’s website or app. I highly recommend it. When you check in early like this, you’re directed to a much shorter check-in line when you enter the airport. Subscribe to get travel discounts, plus links to my latest travel articles via email. 1. Enter the airport at the departures terminal for your airline. If you checked in early online, ask if there’s a shorter line you can go in. At this point they check your passport and issue you a paper boarding pass if you don’t have one. They also put a sticker on the back of your passport and stickers on your carry-on bags. They’ll take any bags you’re checking from you, and will give you receipts with ID numbers. 2. Go upstairs to the U.S. pre-clearance area. To enter this zone, they’ll check your paper boarding pass. They didn’t check them against our passports here. 3. Pass through the metal detectors. Take off shoes and take out anything in your pockets. Put backpacks and suitcases directly on the conveyor belt. Tablets (like iPads) and laptops have to go in the bins on the belt, along with small items and purses. 4. If you wan to get money back on purchases you made, head to the tax-free desks. This is where you declare your purchases, turn over receipts, and get a reimbursement. In our terminal they were near the bathrooms and restaurants. 5. Follow signs for the U.S. pre-clearance area. Wait in line to use the Customs computers. These are self-serve stations. Scan your passport face down, then stand in front of the screen to have your photo taken. Families should stick together and do this all at once (the computer will keep asking if you have another person to scan). When you’re done, it will print out a Customs form for each of you with your photo on it. 6. Follow signs for the U.S. pre-clearance area to the Customs check. They’ll check your passport and boarding pass again, and you will have to pass all your items through a metal detector again. So shoes off, empty pockets, etc. 7. Get interviewed by a Customs officer. He’ll ask about any contact you’ve had with livestock (yes, we patted sheep) and make you throw out any food you’re not allowed to bring to the U.S.
That includes fruit, vegetables, plants, and meat. In case you accidentally brought this with you, there are trashcans where you’ll have to dump it. The Customs officer will also show you a scanned photo of any baggage you checked, to make sure it’s yours. Then he’ll take the paper Customs pass you got at the self-serve station earlier (the one with your photo). 8. Head to your gate, wait, and board the plane. They’ll check your passport and boarding pass again before you board. Got questions about Dublin airport security and Customs checks? Please feel free to leave any questions in the comments section below and I’ll answer them.